This is part 2 of the post series about my previous trip to Mongolia. For our one-week trip, we opted to explore Gobi desert. Even so, my mental image of Mongolia (probably from Chinese period soaps) was the green steppes and horses. So I was still taken aback as the green quickly gave way to earthly, dusty, barren colours as we rode away from the city. We explored the following natural sights along the way. Tsargaan Suvarga or White Stupas was an ancient seabed that was formed naturally by the waters and winds. Now it is completely dry, a magnificent scarp with beautiful stripes of red and white, with clusters of sharp peaks that resemble stupas in land-locked Mongolia. The hike down looked steep and scary, but the deep deep sand provided stability and peace of mind. We hiked down and explored the gentle peaks. How strange that this place used to be the ocean! On day two, suddenly our surroundings turned back to green. We were on our way to Yol Valley, a pocket of cool oasis in the midst of Gobi Gurvansaikhan National Park. We didn't expect to see summer glaciers here! Apparently direct sun never reaches this deep and narrow gorge, resulting in ice all year round. We ended up climbing on rocks and slipping on ice with our inappropriate shoes. On the way from Yol Valley, suddenly the weather turned cold and it hailed, loud ice balls hammering down like crazy, making thundering thuds as it inundated the roof of our van. Ten minutes later, the weather turned back to normal. Khongor sand dunes are the largest in Mongolia, some parts reaching up to 300m. But first, we went for a camel ride on the gravelly land next to the dunes. It was my first time to get up close and personal with these guys. They were very gentle animals but the way they walk made up a bumpy ride, I really enjoyed looking at their gorgeous eyelashes (to keep sand out) and natural eyeliners. We passed by this pleasant calm waters where camels and goats took refuge and drank to their hearts' content. Next, sand dunes climbing. It was completely grueling for my below-average fitness level. We climbed barefooted through the smooth and warm sand that is inclined upwards 30 - 40°. Every time I made one step, the sand yielded and it was reduced to half a step. After almost giving up, I finally made it even though I missed the sunset, and was rewarded by magnificent views of pink sand reflecting the fiery sky. When our guide told us we're going to see some rock paintings, I thought we were going to an art gallery. But I was wrong. The hike looked steep but actually manageable, I'm glad I came back in one piece. These are ancient drawings made by ancient dwellers in the area. This was a fun, if slightly daunting hiking experience, with its undulating and vast red and ocher landscape. I think this was my fave point of interest in Mongolia. So many interesting curves and contours which made it a great photo spot. I felt like little video-game characters. We stayed to enjoy the dramatic sunset here. On our second last day, we left the desert, browns, yellows and reds towards fertile green and blue en route to Ulaanbaatar. It was serene and peaceful. We donned traditional costumes and went horse-riding, listening to our host and guide's folk singing as we rode quietly in the crisp air. Life was simple. In the course of one week, the diversity of natural landscapes that we encountered was quite astounding. The earth was formed, wrinkled, sculpted meticulously, hardened, softened, painted in various colours and patterns, sprinkled with different materials like sand, dust, ice and grass; flaunting different kind of beauties and evoking different feelings. It was like an encounter with the Divine Artist. Stay tuned for part three of the Mongolian series which will be about Ulaanbaatar, culture and food. "Let's go to Gobi Desert." with that one simple sentence, Ave of Eudaimonic 48 and I booked our tickets and planned our Mongolian trip on July 2018. This post is the first part of a series about this trip, which focuses on the overview, what you can expect upon visiting Mongolia, and some travel tips. We chose Sunpath Mongolia tour upon reading great reviews on Trip Advisor. For a 6-day small-group tour, they offered a budget option for 360 USD and tourist-style option for around 1000 USD. "What's the budget option like," I asked cautiously, "Is it basic toilet or just a hole in the ground, is bathroom a bucket of water; is there any hot water? Is it possible to have a shower everyday?" The answer is no. No running water, just a sink. We got a little nervous. No shower for 6 days? NO running water? Nevertheless... we are young and cheapo. Smelling like armpits but save 600 USD?! Bring it on! Armed with wet tissues and courage, we made our way to Ulaanbaatar, Ave through land from Russia, me through the sky from Tokyo. 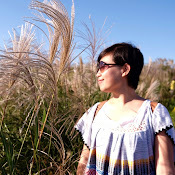 The temperature was at pleasant low 20s Celcius, a refuge from hot and humid Tokyo. In this post, I'll share snippets of our experiences once we drove away the city in this post, while saving Ulaanbaatar for another post. Once out of the city, immediately we're surrounded by the vast, vast landscape. In the middle of nowhere, on the big wide earth. Green pastures towards the city, gradually turning brown towards the desert. With the occasional traffic jam. And occasional stops to say hi to the friendly locals. Our ride: an extremely bumpy but so-called reliable Russian van with natural ventilation (read: no AC). Every day involved several hours of long bumpy rides, with the driver just steered off the sealed roads and out into nowhere. On day three, our Russian van broke down in the middle of the desert. Our tour guide was completely professional and calm that we felt no worries. We filled the time by peeing, talking, and playing charades. Other drivers of similar vans stopped by to help us, even though they're all from different tour operators; so we got to chat with other tourists in their vans too. Lots of mid-aged Australians! After about 1.5 hour, all was well again and we rode off to the next destination. Wait... did I say pee? Yes, no problem, just ask the driver to stop. If you're lucky you'll find some bush that provides modesty. If not, just hide behind the car. No one will look. You're in the middle of nowhere. It is surprising how quickly the act of squatting, removing your pants and excreting waste in the middle of mother nature, right beside the left back wheel of our van, in the pleasant breeze, toilet rolls in hand, became so natural. Definitely a more pleasant experience than one of our many Mongolian lonely outhouses. An outhouse = a little wooden shack; either with or without a door, and a hole where you would do your business. It usually has wooden floor planks as flooring. The kind of outhouse I like would have a deep hole, so deep it just disappears into comfortable blackness, no door but partially covered by a half-fence, no flies, and acceptable smell. Thank goodness we bought perfumed toilet rolls, so we could bury our noses into it while doing the business. The absolute highlight of the trip is nomad ger stay. We have our own private ger, 5 or 6 beds arranged around the circumference like this. The tour provides us with sleeping bags to put on top of the bed. It was cozy and comfortable; we had no trouble sleeping at night. This is our host lighting up the fireplace. Our driver sorta hung out in our ger too, reading his novel. We typically already reached our ger stay around 4-5 pm. The day then ended with slow, tranquil nights, chats during dinners while watching sunsets like this. And waking up to this. Since our nomad hosts are herders, every day we got up close and personal to these guys. Goats are ubiquitous in the desert. Camels are plenty. Usually the families have dogs. Horses are important animals in Mongolia; and we saw more of them in the greener areas. We didn't see any live chickens. The best way to enjoy Mongolia is to go in a tour; the poor infrastructure of the country made it difficult to DIY, even for the most seasoned travelers. Our tour was for small groups (actually, only 3 of us!) with a driver and guide included. The larger your group, the cheaper. Our guide was awesome, she did the cooking for our delicious breakfasts and dinners, and spoke perfect English. It is also possible to do your own private tour and customize your trip. 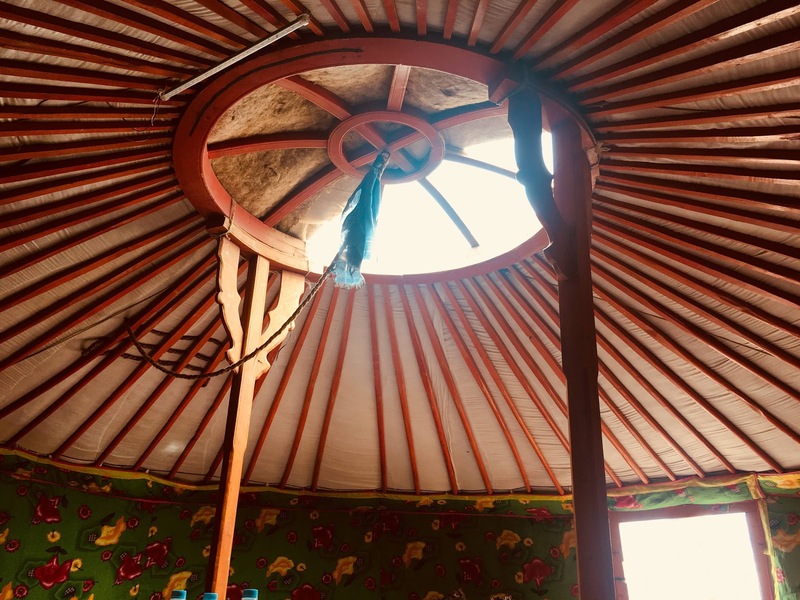 Yes it is possible to go budget if you research properly for a local Mongolian tour (the international ones from Google search usually were priced exorbitantly), and choose nomad ger instead of tourist camp option. The price difference was overwhelming, I'm guessing because running water and electricity is such a luxury in the desert. Bring your own head torch and power bank with huge capacity. Find ways to recharge your camera / bring extra batteries. The non-showering for days was actually manageable, because of the pleasant cool and dry weather during summer. Arm yourselves with plenty of wet tissues to clean yourself. You'll be surprised with how dirty your feet and hands are! Summer is the best time to visit Mongolia because of the great weather, there is also the famous Nadaam festival (which we sadly missed!). Yes it did get hot during daytime in the desert, but at night quickly the weather cools down. I imagine snowy Mongolia would be breathtakingly beautiful too, but beware that during winter the temperature could go down up to a bitter -30°C, and many ger camps will be closed. One week was a rather short time to explore this huge country, so we only had time to cover Gobi Desert. If you could, set aside at least 2 weeks to sufficiently explore wider areas. Expect that you'll need to be in the car for long hours everyday. Everyday we would ride from around 9am - 5pm, with breaks along the way. Even so, we felt the trip was slow, chill, with plenty of time. Enjoy the ride, it's a huge part of the experience. Our trip was truly an escape: simplicity, closeness to the breathtaking nature, stillness and quiet moments. Stay tuned for the next post about the natural attractions we saw in Gobi desert.